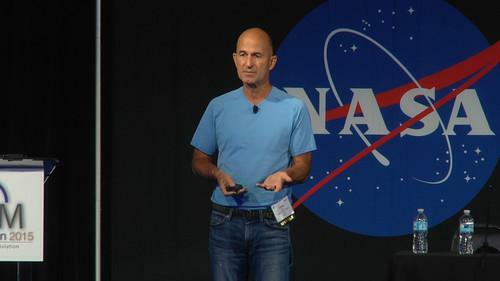 Dave Vos, head of Google's Project Wing, speaks at a drone conference at NASA Ames Research Center in Moffett Field, California, on July 29, 2015. To bring order to low-altitude airspace so its Project Wing delivery drones can get off the ground, Google is proposing a set of rules for operating aircraft below 500 feet. The proposal calls for all drones, including those flown by hobbyists, to constantly transmit identification and position information so airspace access and collision avoidance can be managed by computer. The proposal, unveiled on Wednesday by Dave Vos, head of the Wing project, seeks to take moment-to-moment control of airspace under 500 feet away from air traffic control authorities and put it in the hands of private airspace service providers, he said. These companies, which he called ASPs, would receive data from all craft in flight, including hobbyist drones, emergency helicopters and commercial craft like those being developed by Google Wing. Before every flight, each craft would send a short flight plan. The flight might be approved as requested, approved with modifications to take into account other users, or denied. "There's this fundamental enabler called the airspace management system. We have to build one, and we think everybody that wants to build one should be able to build one," said Vos, outlining a vision of competing ASPs. The ASPs would exchange information about airspace users and communicate with current air traffic control systems only when there was something important going on. Run-of-the-mill flight and control would remain within the ASP-controlled system, he said. Right now, use of this low-altitude airspace is largely unregulated and hobbyists are able to fly without having to identify themselves, their vehicles or detailed flight plans. That's one reason the Federal Aviation Administration (FAA) only allows drone flight within visual line of sight. But if Google, Amazon and other companies are to use drones for package delivery and other services, the line-of-sight restriction will need to be lifted. "We definitely want to push the definition of this Class G airspace where we'd like to operate," said Vos, referring to the FAA's designation for most unregulated airspace. "There's a lot of business to be done there." Vos is proposing the system be based as much as possible around technology that already exists, to reduce development and standardization time. That means drones and aircraft would use ADS-B, an aviation industry standard used on many airliners that sends out position, heading, speed and identification data every few seconds. All large planes already have ADS-B transponders, but with entry-level equipment starting at around $2,000, many smaller aircraft do not. Earlier this year, Google said it had started development of an "ultra low-cost" ADS-B transponder that will be cheap enough that every operator will be able to afford it. "If you can't afford it, you can't afford to fly, in my opinion," he said. "That means we need to make sure everyone can afford it." He also wants to use existing cellular networks for the two-way data paths between drones and the ASPs, and he called on network operators to get involved. "Join us. You guys can make a ton of money and so can we." If the FAA takes up Google's proposal, Vos said, it will make flying "significantly safer and significantly more reliable and better performance," but Google clearly has a heavy commercial interest in changing the current regulatory regime. It and Amazon have been two of the most vocal proponents for a new set of rules and regulations that would allow companies to use drones to make money. The FAA is also being lobbied by filmmakers, real-estate agents, engineers and others who see drones as a way to change or improve that way some work is currently done. Vos delivered his proposal at a drone conference at NASA's Ames Research Center at Moffett Field, California.